Beans, both dried & canned, are an important ingredient when it comes to creating delicious budget friendly meals. Using beans instead of more expensive proteins is the ideal way to nourish your family with a hearty and tasty meal at half the cost. Pasta e Fagioli is a soup I grew up eating. If you search the internet you will find there are many different ways to prepare this mouthwatering soup so have fun with the recipe below adding or subtracting to make it your own. Heat olive oil in a large pot over medium heat. Add the garlic, onion, red pepper flakes, and rosemary, cook 2 minutes. Stir in the tomatoes and their juice. Cook for 3 minutes. Add the beans, 2 quarts water, bay leaves and parmesan rind. Cover and bring to a boil, then reduce the heat to low and simmer about 30 mins. Uncover and bring the mixture to a boil over high heat. Add the kale and cook about 5 minutes. Add the pasta and cook about 8 minutes. Remove the bay leaves and cheese rind. Ladle into bowls and serve. Your soup looks so good right now! I've been fighting off a cold since Tuesday and this would feel so good going down! Can you believe I've never made nor eaten pasta fagiole? Yours looks wonderful and would be fabulous on a chilly day! I think all soups should have pasta in them! yes i like this soup! One of my favorite soups, looks tasty! Looks like a great hearty soup!! This soup loos so good! I want a hot bowl of it now! Such a great classic soup and perfect for this weather! Bean soups are the best! This soups sounds so hearty and delicious :) Great recipe! I need to try more bean recipes like this! This is my favorite kind of soup. Beans and pasta!!! One of my favorite soups. Great job! This soup looks seriously tasty! I would love to try it. This is one of the few soups I actually like. I'm not a big soup girl. But I love this one. Something about it just makes it so comforting and yummy. Love your version, comfort food in a bowl. One of my favorites that I usually order out now I'll make it at home! I've never made pasta e fagioli. I've always wanted to and knowing it's on the budget-friendly list, I may just move it up on the dinner list! 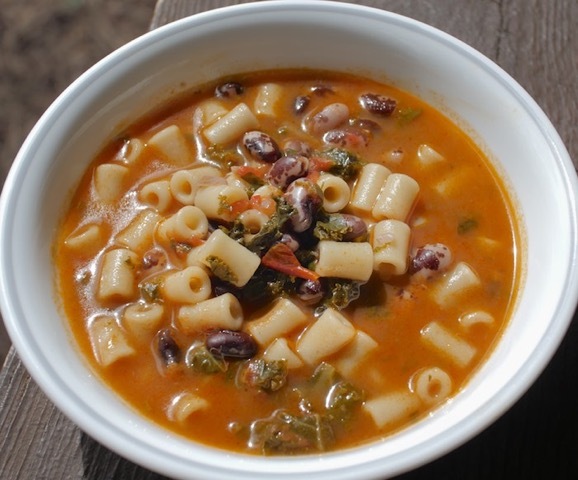 Pasta e Fagioli is the most perfect soup! It's so perfect for a cold winter day. My gran used to make a KILLER version of this! Need a bowl now! Ah, this is such a great fall comfort food!! Thank you so much for participating in #TryABiteTuesday link party! Hope to see you back this week, the link up is live! Grew up eating this every Wednesday night. Made this for dinner tonight. Super easy and super good! Only thing I did different was instead of cooking the pasta first; I just added the uncooked pasta to the soup while it was simmering. I needed to add a little extra broth/water in the end after it had soaked up in the pasta; but a 1 pan clean up is worth it :) Thanks for this great weeknight recipe that I could make after work and have dinner ready for me and my boys.